Photo courtesy of CTV3 Belize News. The bulldozing and destruction of the ancient Maya site at Nohmul, in the Orange Walk district of northern Belize, has recently received widespread international attention. The largest structure of the ancient ceremonial center was reduced to rubble for use as road-fill by a local contracting company, a widely condemned act that will likely result in minimal consequences for the perpetrators. This incident, and others like it, are examples of the vulnerability of major historical sites, demonstrates the importance of the archaeological landscape for communities, and brings up issues of cultural heritage and engaged anthropology. Nohmul was a medium-sized city founded in the Middle Preclassic period (650 BC – 350 BC). Interestingly, its fortunes waned during the Early Classic period (AD 100 – 250), when it was all but abandoned, only to be re-occupied during the Terminal Classic (AD 900 – 1000), when ties to the Yucatan peninsula are evident in its architecture and ceramic assemblage. Nohmul is one example of Maya longevity, memory, and re-use of important sites. When they re-occupied it in the Terminal Classic is was already an ancient place – at least 1000 years old. Nohmul has been a marker of place, history, and ancestral heritage for more than 2,000 years (see Hammond et al.). Though a small nation, the Belizean landscape is blanketed with ancestral remains of the ancient Maya, from densely populated cities like Caracol to villages such as Chan in the Belize River Valley, as well as countless unnamed hamlets throughout the country. 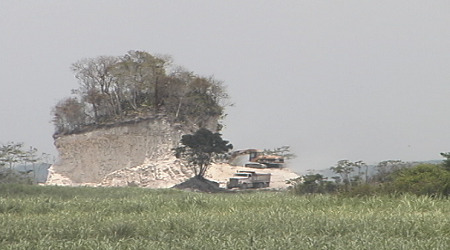 As the Director of the Institute of Archaeology, Dr. Jaime Awe, pointed out in a recent interview with Belize’s Channel 7 News, the size of the Institute of Archaeology is miniscule compared with the archaeological resources they are tasked to manage, and Awe’s frustration over the events at Nohmul is palpable in the interviews he has given to the press. This is not to minimize their significant efforts – last year archaeologists from the IA successfully and efficiently excavated late Preclassic period archaeological remains encountered during road construction in downtown San Ignacio. They also actively oversee and grant permits to numerous archaeological research projects taking place throughout the country. While Nohmul and sites comparable in size are important pieces of the archaeological record, looting, construction, and mechanized agriculture have continually eroded the ancient landscape in Belize. Smaller sites especially, are often destroyed for the sake of convenience, profit, or out of ignorance. 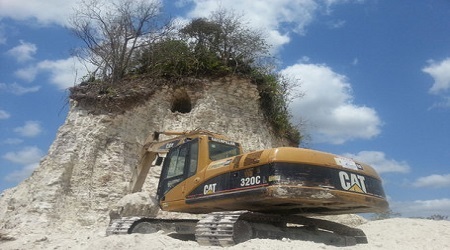 The destruction of the large Nohmul structure caught the world’s attention, but is just one example of heritage distancing in Belize, a concept introduced by Patricia A. McAnany and Shoshaunna Parks in their article, Casualties of Heritage Distancing: Children, Ch’orti’ Indigeneity, and the Copán Archaeoscape. Though their argument focuses on the archaeological park of Copán and its relationship with the indigenous Ch’orti’ population, the concept of heritage distancing is illustrated by the recent events in northern Belize. McAnany and Parks argue that while monumental site cores are protected and developed for tourism, the archaeological landscape outside of site centers is undervalued and in danger of destruction. Further, a lack of community outreach and engagement about the value of archaeological resources to cultural heritage and patrimony only exacerbates the risk. A work crew excavating the Nohmul site to be hauled away as road-fill. As one of the tallest man-made structures in Belize, the Nohmul temple was certainly monumental, and it was located in a site center, so what happened? We would argue that the destruction of the structure is an apt example of heritage distancing; the site was not developed, was located on private property, and its use as a source of road-fill was reportedly begun 15-20 years ago. Perennial use of the structure for road fill points to a distancing from the archaeological landscape, which ultimately contributed to its destruction. Despite public outcry and condemnation by the government of Belize, the IA, and the Belize Tourism Board, there is also a common sentiment in Belize that such acts are not surprising, and can even be expected in the current political-economic climate. The maximum fine of $10,000 BZ ($5,000 US) for the destruction of national heritage sites confirms that sites such as Nohmul are vulnerable and not sufficiently protected. In the end, this troublesome event is evidence of the need for more active engagement with local communities in order to protect archaeological heritage. Educational programs such as those undertaken by InHerit are bringing an appreciation of ancestral heritage to rural Maya populations in Mexico, Honduras, Guatemala, and southern Belize, however outreach to the wider Belizean public is difficult to achieve. Balancing heritage with the requirements of a contemporary landscape (i.e. paved roads, agricultural fields, expanding neighborhoods) is tricky, but crucial. Sites like Nohmul are important for all Belizeans, and especially so for descendant Maya communities, an already marginalized population throughout Central America and Belize. Associated with that marginal status is a limited ability for contemporary Maya to influence the use and protection of such sites. To us, as applied anthropologists working in Belize, the incident at Nohmul brought up issues of engaged research. To what degree are we responsible for engaging local communities with our work? Was it a lack of engagement from anthropologists that contributed to the bulldozing of Nohmul? How do we make our research relatable to contemporary populations? Would educational programs have made a difference in the decision-making that led to the destruction of a place that was valued by the ancient Maya for thousands of years? How can we balance the demands of rigorous field seasons with community outreach? Answers to these questions are appropriately complex and probably specific to each project or researcher. The events at Nohmul illustrate the tension between the conservation of archaeological resources and the separation of heritage from local development priorities. As anthropologists, we need to prioritize focused engagement with multiple communities and stakeholders if damage like that perpetrated at Nohmul is to be avoided in the future. Claire Novotny is a PhD candidate in the department of Anthropology at the University of North Carolina at Chapel Hill. She is currently conducting dissertation research in the Toledo district of southern Belize at the ancient Maya site of Aguacate. A community-based archaeology project, Ms. Novotny’s research incorporates community heritage consultation and educational initiatives. douglas carl reeser is a doctoral candidate in the Department of Anthropology at the University of South Florida, and is a contributing editor at Recycled Minds. He is currently working on his dissertation based on research in southern Belize, examining the intersection of State-provided health care with a number of ethnic-based traditional medicines. He also loves food and running with the wind. This article also appeared in Anthropology News, the online newspaper of the American Anthropological Association. What a crime!! But like it says in the article, it's a tricky situation - balancing contemporary needs with heritage preservation. Nevertheless, it's a shame that something so historic was destroyed for something as banal as road-fill. Conservation, preservation, and how to use our natural and historical resources remain problems we have yet to figure out as a society. Whether archaeological, environmental, or merely historic, humans don't seem to have a problem with bulldozing things and building new things, often of lesser quality, and with no environmental benefit. These actions are done in the pursuit of money and wealth, and without consideration for the future. While the species has some visionaries that are able to consider the wider world outside of their own interests and personal present, most humans are stuck in the world of survival by the dollar. This has fallen out of view in the news and public attention in Belize and internationally, but it sounds like the land owner and the owner of the construction company will be fined the maximum allowed under law, which is correctly stated in the article. The whole thing might lead to changes in the law, but that might also just be talk to appease the press and public. "Prime Minister Dean Barrow announced at his mid-morning press conference today that the no charges have been brought against anyone so far in connection with the destruction of the Noh Mul Maya site in northern Belize. PM Barrow explained that the Director of Public Prosecutions (DPP) has called for additional work to be done on the case file to complete the investigation. This includes interviewing and taking statements from cameramen who filmed the destruction as well as the drivers of the truck that were hauling away the material which were used as road fill. The Prime Minister says the police hope to complete the additional work by Friday."